Living in Europe, I can find flour tortillas on the grocery store shelf…but I cannot bring myself to pay the price, especially when I know that with 3 cups of flour and a few other ingredients I can make ten of them in about 20 minutes. I once hosted a very large group of Italians for a taco meal–so I bought half of the tortillas and made half of them. The flavor of the store-bought ones couldn’t hold a candle to the homemade ones! So even if you live in the Land of Plenty (the Good Ol’ U.S.A.) you might want to consider making your own tortillas just for the improved flavor. 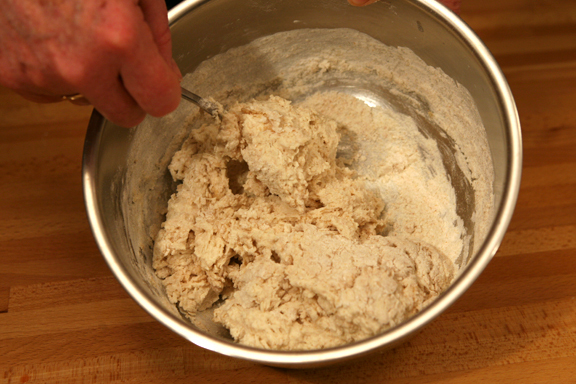 Combine the dry ingredients in a bowl; add the water and oil and mix until well combined. 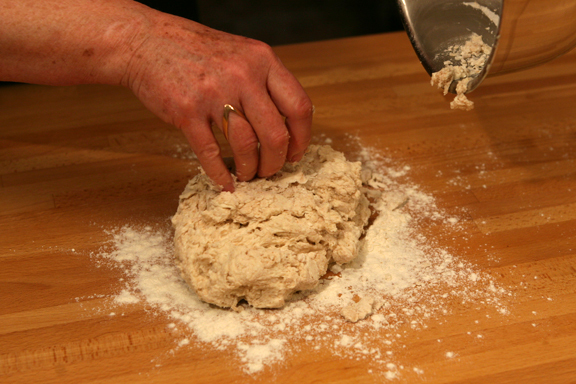 Dump the entire mixture onto a floured surface and knead it a minute or two just to make sure it’s well-mixed. 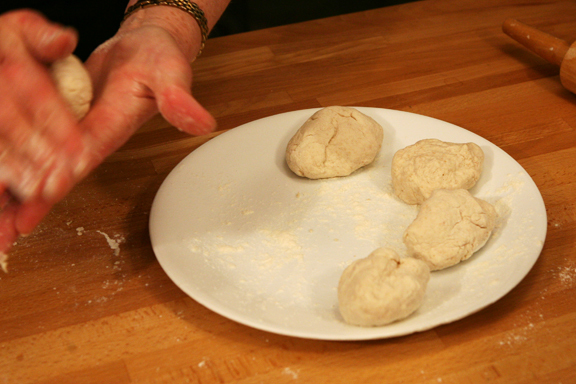 Then, divide the dough into 10 equal-sized balls. I usually shape it into a log and cut it in half; then I divide each half into five equal-sized pieces. 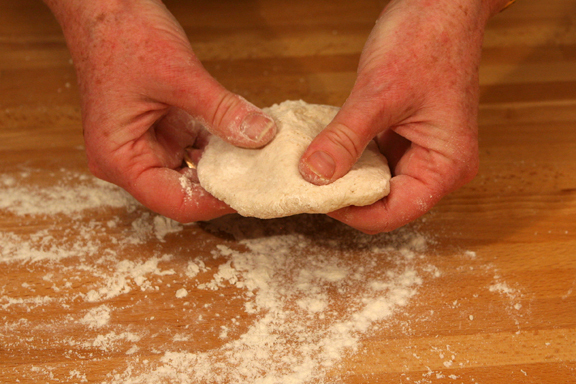 Roll each piece into a ball and set aside on a floured plate. It’s a good idea to cover them with a dish towel so they don’t dry out while you’re rolling them out. Use your thumbs to lightly press each ball into a flat disk and then use a rolling pin to roll them out as thin as possible. Heat a cast iron or Teflon-coated skillet until very hot. 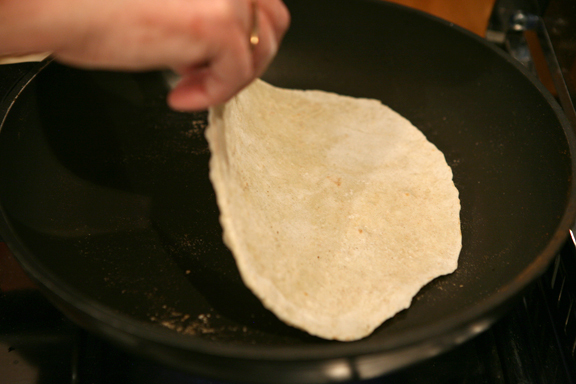 Lay the tortilla in the pan for 1-2 minutes, until small bubbles form. Flip it over and brown lightly. Set aside and cover with a saucepan lid or towel to keep them soft while you continue making the remaining tortillas. I begin by combining these ingredients in a bowl (or food processor)…and mix it well. I’m always looking for ways to make recipes healthier so I used 1 C. whole wheat flour and 2 C. of regular flour. So my tortillas may be a bit darker than yours if you use all white flour. 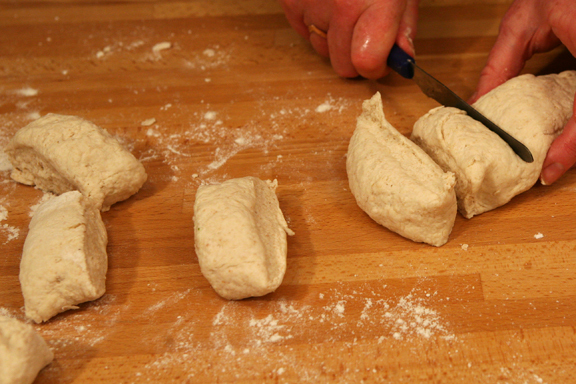 …and then cutting each half into five pieces. I find this method helps me get the pieces pretty uniform in size. 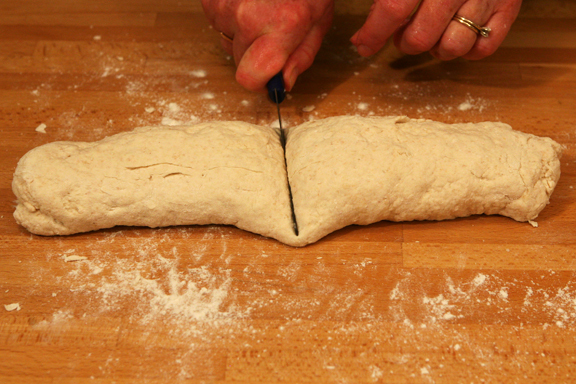 …and then use a rolling pin to roll it very thin. 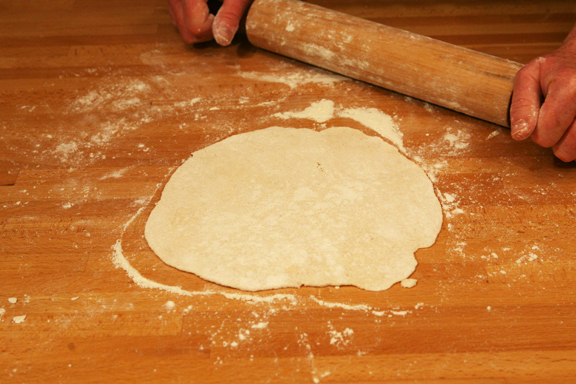 I roll from the center toward the outside, rotating the tortillas frequently as I roll it out. While I’m rolling out my first 2-3 tortillas, I’m preheating my 12-inch Teflon-coated pan since it needs to be good and hot. That’s the only type pan I’ve ever used….so I can’t vouch for anything else. Do not grease the pan. If the only Teflon-coated coated pan you have is small, consider making smaller balls and making smaller tortillas. I usually use a spatula…don’t know why I’m using my fingers here to flip it over! But they never stick…it’s that easy. I find it works much better to cook them quickly…if you have the burner too low, they dry out and get more like a cracker so you can’t roll them up. Once they’re done on both sides, I just stack them up on a dinner plate and cover them with a large saucepan cover. This helps to keep them softened. So now we have our salsa made…tortillas made. Next time we’ll complete the other toppings and put together our terrific tacos. I hope you can stand the wait…I’ll write again in a day or two!